Over 80% of traditional teller transactions can be handled through a self-service device. Investment in ATM deposit automation and cash recycling functionality yields big returns through a more streamlined cash and check deposit process that eliminates envelopes. Cash automation functionalities allow bank staff to focus on high value sales, product promotion and service activities and less on low value transactions and ATM cash replenishment. Leveraging the capabilities of ATM deposit automation and cash recycling are key to an efficient and effective remote ATM/debit delivery strategy. Cost aware financial institutions are reshaping their branches towards a sales and service business model rather than a transaction processing model. As the need for low value tasks has diminished, the drive to enhance self-service capabilities has risen to the forefront. The automation of deposit validation, counting, sorting, storage and cash dispensing saves time and money. 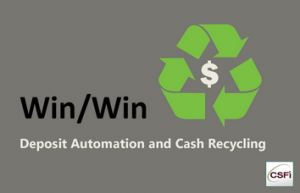 ATM cash recycling and deposit automation devices allow branches to operate more efficiently with less cash on hand. The immediate and proven benefits of cash automation have inspired rapid global adoption and remarkable enhancement of the technology. In response to clear demand, providers have stepped up with enhanced hardware and software solutions. The latest dedicated “pocket” recyclers deliver a vast increase in note capacity and improved customer experience for both individual consumers and small business customers. SWITCHWARE® G4 is designed to maximize the profitability of multi-vendor ATM fleets and other integrated self-service devices. As a certified supporter of the latest innovations in cash recycling and deposit automation from nearly every major provider, CSFi is qualified to discuss how cash automation technology can accelerate branch transformation efforts in your unique operating environment. CSFi solutions can maximize the efficiency of your branch network by addressing the needs of individual consumers as well as the needs of small to medium sized business. Cash automation solutions represent a major opportunity for financial service providers to streamline operations and enhance their bottom line.